•When the float lowers down, the release valvae opens. 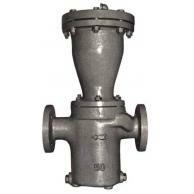 •Liquid fluid flows through the strainer eliminator. •Air should be separated from liquid to upper port, and then releved to outside through the release valve. •When float rises, the release valve is closed. •When the float is rising as liquid level increases, the release valve closes at the same time. Copyright © 2010- new-flow All Rights Reserved.